Primal Carnage: Extinction is a class-based online multiplayer shooter unlike any other, featuring fast-paced combat, diverse environments, and over-the-top action. On a mysterious island overrun with prehistoric monsters, you can choose to fight as a variety of legendary dinosaurs or to join the human mercenary team armed with a unique, distinctive, and destructive arsenal aimed at making these bloodthirsty beasts extinct once and for all. Will you use a sniper rifle or flaming chainsaw to bring these hulking creatures to their knees? Will you swoop, stomp, or chew through the puny human intruders? The only real question is can you survive? Thirteen Diverse Environments - Extinction features thirteen unique environments, including 3 all new maps: ‘Transfer’, ‘Verdant’, and ‘Contingency’. Unique Dinosaur Gameplay - Experience the relentless power of 9 unique dinosaur classes. Sneaking, blinding, charging, eating, or flying- there’s no shortage of ways to destroy the enemy team. 5 Human Classes - Survive the island as one of 5 distinct human classes. Obtain and equip new weapons and items using a loadout system. Steam Economy Support - Players have a variety of outfits, weapon skins, hats and other accessories to choose from for their human characters as well as quills, feathers, spikes, chains, horns, and a variety of new skins to attach to their dinosaurs. Item Drop System - The game rewards players with loot at the end of every match round. These items can be traded and sold through the Steam marketplace! Epic Soundtrack with unique tracks for each character. REVERB PUBLISHING, and the related design logo, are trademarks of Reverb Communications, Inc., in the United States and elsewhere. 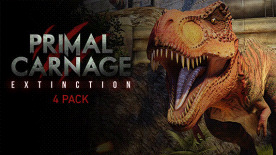 This pack contains 4 copies of Primal Carnage: Extinction.